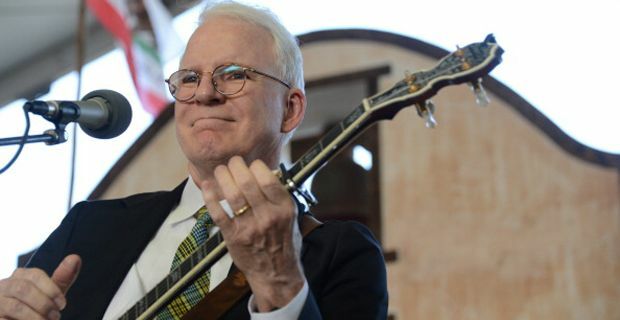 Legendary funnyman and 80’s sort of pin up, Steve Martin has fathered his first child and become a father at the ripe old age of 67. The star of films such as Roxanne, Parenthood, It’s Complicated and Father of the Bride and his wife, Anne Stringfield, 41, apparently had the child in December. The famously private and guardedly discreet Martin and Anne were spotted nearby their LA home with the newest addition to the clan. The couple married in 2007 at Martin’s home in a surprise ceremony where guests, including Tom Hanks and Diane Keaton were told that they were simply coming to a party. Kept under wraps until the very last minute when the guests had already arrived, their wedding was a testament to their feelings about their privacy. Begging the question why are we writing about it? But anyway – being 67 is well known to all 67 year olds as actually being the new 40. Steve certainly still has a spring in his step (and not just his step it would seem), and having starred in endless films about being a mildly hapless parent desperately trying to keep his family life on an even keel and generally rolling with the punches, he certainly has had a fair bit of practice at daddying – at least when in character.